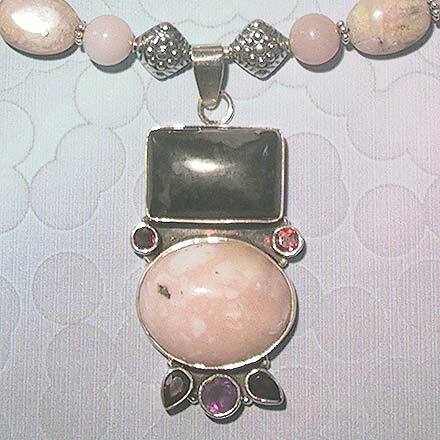 Sterling Silver Pink Peruvian Opal, Jasper, Garnet and Amethyst Necklace. See Closeup. 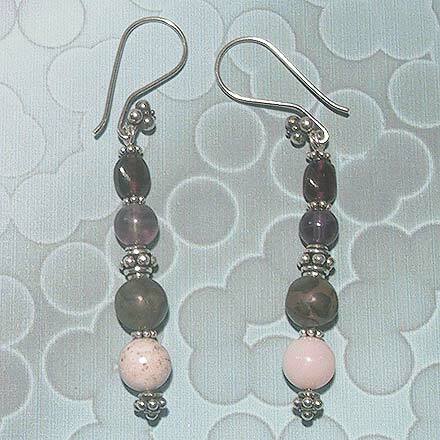 Sterling Silver Pink Peruvian Opal, Jasper, Garnet and Amethyst Earrings. The 2¼" pendant almost seems anthropomorphic, but in a very abstract yet prehistoric sort of way. 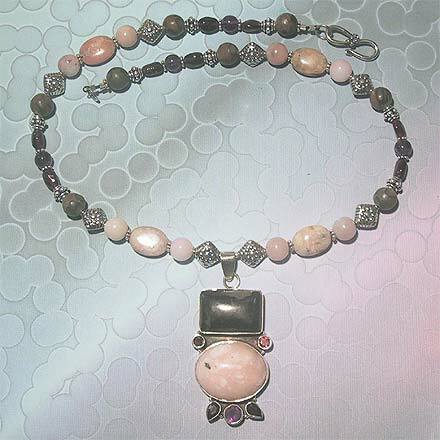 This jewelry set has quite the combination of stones, Pink Peruvian Opal, dark Jasper, and Garnet and Amethyst top it all off. The necklace is 18" and the matchng bracelet is 7¾". For those who are interested in Astrological significances of stones, Amethyst corresponds with Pisces and the month of February. Garnet corresponds with Capricorn and Aquarius and the month of January, and Jasper corresponds with Virgo and Leo.